The MC80 Liberty type Star Cruiser is the spearhead of the Rebel Alliance’s fleet, and it boasts some of the heaviest firepower in the Rebel arsenal. Its impressive firepower and powerful forward shielding, demand that it is often among the first ships considered to lead Rebel strike forces into combat. 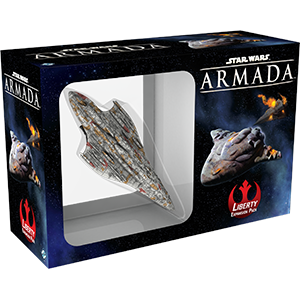 The Liberty Expansion Pack introduces the Liberty miniature as a large-base Rebel ship, as well as two ship cards, and fourteen upgrades, including a new commander and three unique Titles.